...in Asia, the presbyter who composed that writing, as if he were augmenting Paul's fame from his own store, after being convicted, and confessing that he had done it from love of Paul, was removed from his office. Another example would be when the Roman physician Galen happened to find a forgery written in his name for sale in a bookshop, and so wrote a pamphlet describing how to tell the difference between works written by him and the forgeries. In the New Testament, 2 Thessalonians 2:2 makes mention of a forgery: Paul tells the readers to disregard a letter which purports to be by him and his companions. 2 Thessalonians itself, however, is widely believed by modern scholars to be a forgery. The passage which I've quoted in the picture represents one example of the differences between the Pastoral Epistles (First Timothy, Second Timothy, and Titus) and the genuine letters of Paul by which it is known that the Pastoral Epistles are not written by Paul, but are forgeries written in his name. In the genuine Pauline letters, it can be seen that Paul was in favor of women playing an active role in the Jesus movement, including speaking and teaching in the assemblies. For example, in Romans 16, Paul writes greetings to many women whom he considers fellow workers in the gospel, including Junia– apparently an apostle– whom he praises as "distinguished among the apostles". He also sends his greetings to Phoebe, the deacon of the church in Cenchreae. In other letters he speaks of men and women being equal: Galatians 3:28, 1 Corinthians 7:3-5. In contrast, in the Pastoral Epistles, we can see the start of the marginalization of women in Christianity. The author is against women being teachers or leaders, and wants them to be completely silent and submissive. The reasoning given is that Adam was the one made first, then Eve. Plus, Eve was the one who was deceived– the implication possibly being that women are more easily deceived than men, and if they were allowed to be teachers, they could pass deceptions to the men as Eve did. But for all their faults (according to the author) there's still hope for women– it says they can be saved through childbirth! 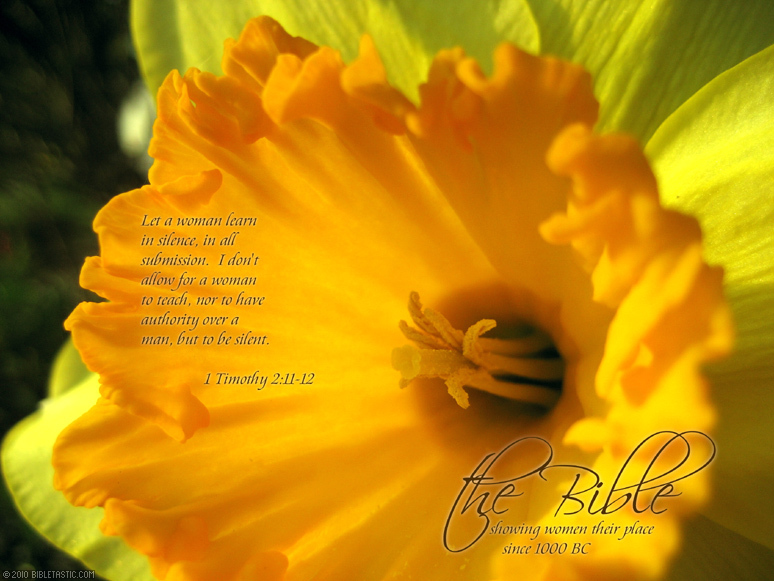 1st Corinthians– a genuine letter of Paul– also has a passage that says that women should be silent: 14:34-35. However, it can be seen that this part was added by a later scribe by, among other things, the fact that among the available manuscripts, those of the Western text-type place those two verses after verse 40, instead of after verse 33, as in the manuscripts of the Alexandrian text-type. The passage likely originated as a margin note added by a scribe, which later got incorporated into the text– some scribe inserting it after verse 33 while making a copy, and a different scribe adding it after verse 40. Another indication of the different historical setting in which the Pastorals were written are the references to Gnostic Christianity in 1 Timothy 1:4 and 6:20. Gnosticism was a later development in Christianity– it did not exist in Paul's time. Although the significance of vocabulary differences has been disputed, it should also be noted that the large difference in vocabulary between the Pastorals and other Pauline letters is another reason for thinking that the Pastorals are forgeries. P. N. Harrison's 1921 book The Problem of the Pastoral Epistles shows that of the 848 words contained in the Pastoral Epistles, 306 do not occur in any of the other 10 Pauline letters. Plus, the vocabulary of the Pastorals matches much more closely to that of the later second-century Christian writings than the other 10 letters do (page 26). The writings of the early Christians also stand as evidence against Pauline authorship of the Pastorals. There is no quote from the Pastoral Epistles before Irenaeus in 170AD. Also, the earliest known canon of Christian scriptures consisted of a modified Gospel of Luke and Paul's letters– but did not include the Pastoral Epistles (Against Marcion, book 5 ch. 21). This canon was compiled by Marcion, whom I've mentioned in a previous post.